October is here and the clocks go back - meaning we all gain a well-deserved extra hour on what often marks the first frost and human hibernation mode. 2016 is particularly significant as it is the 100th anniversary of the first time that clocks in Britain were turned back after BST. This year the clocks go back on Sunday 30th October and UK British Summertime officially ends - meaning we revert back to GMT once again. Why do we change our clocks every year? Whether you like it or not, you can thank a British builder called William Willet for really championing the idea. 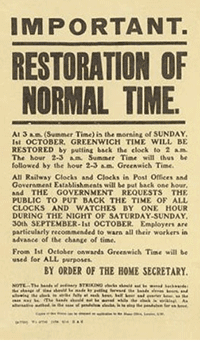 Although not an entirely new idea, after publishing ‘The Waste of Daylight’ in 1907 and several unsuccessful attempts to get the law passed - in May 1916, due to the outbreak of the first world war and the need to preserve coal stocks - Britain finally passed the bill and the Home Office issued posters instructing the public ‘how to reset our clocks’. 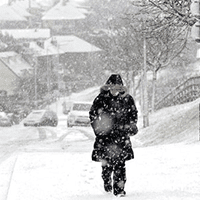 So, the clocks go back and Winter is finally on its way. Reports are already indicating that this year’s winter will be significantly colder than the mild winter we experienced last year in which El Nino stole our cosy hopes of snow. Whether you have Gas or Electric heating - it is always best to keep your heating well maintained and in good condition, so start your winter checklist early. Test your heating for cool spots and noisy pipe circulation, as you may need to bleed your radiators. Are there any areas in the house that require extra heating? Perhaps its time to add an electric radiator to your conservatory and use it all year round. Don't wish winter away. Yes, it is cold and dark outside and the days seem shorter, but there is so much to enjoy and Winter festivities are in abundance. Spring will be here before you know it and you will lose your hour once again. The clocks will continue to go back and forth until someone as brave as William Willett pushes forward a theory to make us Brits refrain from habit in which we are so accustomed to. So, brace yourselves... Winter is coming.